In this episode of Avengers Now! Antony and Paul look at some recent Avengers books, plus they travel back for another installment of Avengers Then! Let's hope that the Wasp doesn't fall asleep while they're away! Avengers Now! 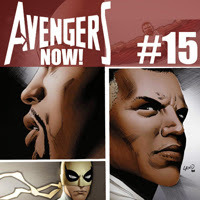 - Uncanny Avengers #16, New Avengers #14, and Mighty Avengers #6. Avengers Then! - Avengers #55 and Avengers #56.